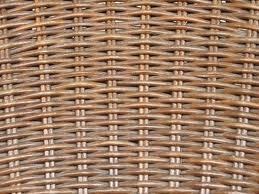 Rattan is the material used in the weaving of furniture. Wicker furniture refers to the process of creating woven furniture and is mainly made of Rattan but other materials such as Straw and Bamboo could be used under the same heading. Rattan in its original form is a relative of the tropical palm tree. Rattan starts to grow upwards like a tree, but then bends back to the ground and snakes through the rain forest like a vine.